Do you get frustrated when you hear people laughing at the Christian faith? Do you feel tongue tied when people start to talk about things like life on other planets and evolutionary theory and how they threaten Christian views? More importantly, do you get frustrated when your kids hear things outside of the home that may make them doubt God? These objections can be heard in science class, on the playground, at lunch, even in the grocery store. They may come up at other kids’ houses, where other parents are feeding into the conversation as well. It’s one thing to say, “Because I said so.” It’s another to have answers available that can help your child see the truth about our Lord and savior. Kids need to be armed now more than ever before. A question so easily thrown out like, “How can you know there’s a God?” has some great answers. Everyone in the family should know them. 7 most common objections to our faith. Today, I have a guide to prepare your children for the objections they will surely hear. 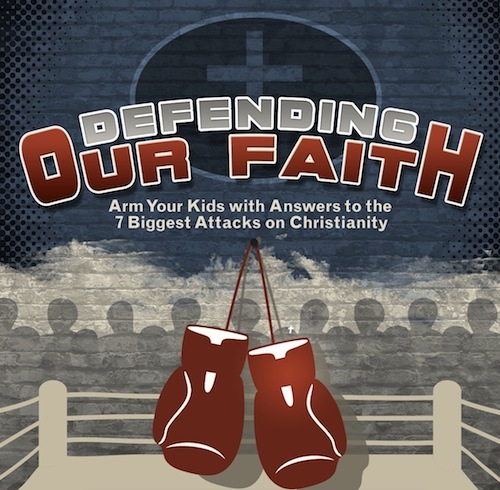 The “Defending our Faith Parent's Guide” is provided as a downloadable PDF ebook. You get instant access, and can be equipping your kids with the tools to defend their faith at dinner tonight! It can be used in many settings- at home, in a study group, Sunday School, etc. The material is valuable to Christians ages 5-105! (because we all hear the same objections). We have divided the material into seven chapters, each covering one of the seven objections to our faith. First, we are presenting the objections in grownup speak so that you can understand a broad view of the subject. Here, we present passages you can read to your children, which are in easier language. This section is truly unique. We include word-for-word scripts and responses that can be practiced at home. Your family will never be tongue tied again when facing an objection to your Faith. We have provided the words that will make you a champion of your faith with just a small amount of practice! You can take one subject a day or one subject a week. Try to turn it into a fun family time to discuss these things with your kids. Children who are prepared are in a much better position to avoid doubt than children who have wrestled with a question alone. The joy and satisfaction you'll experience, when you children is confronted with a challenge to their faith and they can confidently respond with grace and poise. 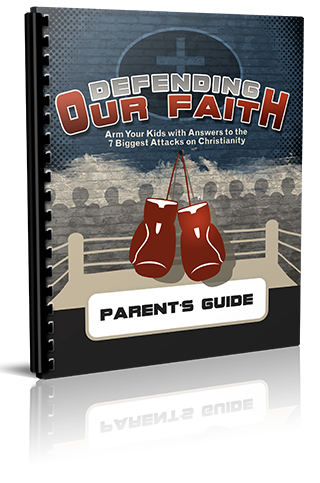 Right now you can take advantage of our special introductory offer and get our Defending our Faith: Parent's Guide for just $7. If you're thinking, "$7 is so affordable - what's the catch?" - there isn't one. $7 puts "Defending our Faith" within reach for the vast majority of parents, which is my #1 goal. 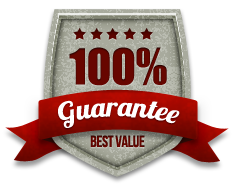 That’s right, we are so sure that you will love Defending our Faith that we are offering an unconditional 100% money-back guarantee. With “Defending Our Faith”, you won’t need to search for the answers- they will be at your finger tips! YES, I want in! I want my own copy of "Defending our Faith" that I can use over and over again. Please give me INSTANT access to the material right now!